Promising combinations of the modern with the classical: this is demonstrated in developments in the field of additive production. The maxim is no longer simply "printing instead of machining", but increasingly "printing and machining". Hybrid machines are gaining ground and extending proven machining techniques. There is hardly a production process, whether in industry or in the private sector, which enjoys such a cult status as 3D printing. This catchy term helps a long-known process to gain prominence and suddenly to be discussed in every corner of the land as a revolution in production. “The prediction that everyone would be producing his own replacement part at home on a 3D printer has in the meantime faded,“ says Dr. Wilfried Schäfer, CEO of the Metav organiser VDW (German Machine Tool Builders' Association) in Frankfurt am Main. Rather, discussion is now centering on advances made by 3D printing, also known as Additive Manufacturing (AM), into industrial series, or at least small batch, production. Away from the Rapid Prototyping of the 1990s and now away from Rapid Tooling to Rapid Manufacturing – that is one description of the present stage of development. This has been taken up in the new concept for next year's Metav in Düsseldorf. Under the heading “Power your Business”, it is presenting in its Additive Manufacturing Area the whole spectrum of additive processes, materials and available services associated with 3D printing. The Metav is thus expanding and supplementing its range of production technologies in all sectors, especially in the production of metal components, in machine, aerospace, automobile and tool construction and also in medical technology. As a production process, Additive Manufacturing (AM) meshes with the other central processes in the value creation chain in metal working. The most important of these are CAD and simulation, follow-up processing, production measurement technology and quality assurance. Alongside pure AM systems, hybrid concepts are also developing, combining AM processes with classical machining. “This is a very interesting solutional approach for many users,” explains VDW’s Schäfer. A similar review is voiced by Dr. Eric Klemp, CEO of the Direct Manufacturing Research Center (DMRC) at Paderborn University and responsible for the programme of the specialist conference “Inside 3D Printing” at the Metav 2016. The integration of additive production processes into the machining process offers a range of possibilities for the user: “By combining material deposition and removal in one machine, it is possible to integrate functions which were previously out of the question. It is thus possible to use different kinds of material in one production process. An additional benefit is that the machine constructors’ many years of know-how can go into the process.” This 3D expert sees further advantages in the possibilities of mass production and standardisation, and also in the aspects of precision, reproducibility, producing undercuts, exploiting freedom of form and saving material. Not least, two processes are united, which helps in making joint use of the advantages of both processes. Rainer Gebhardt, project leader for the VDMA working group Additive Manufacturing, lists among the advantages of hybrid machines freedom of design and processing in one clamping. All of this leads to gains in precision. It is generally true that deposited contours, in most cases, require follow-up work. This can be realised very flexibly on the hybrid machine. 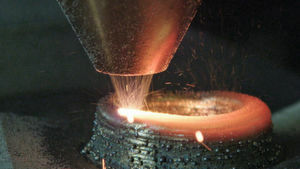 As far as the integration of additive production processes into a complete processing machine is concerned, as Reinhard Koll, manager of application technology at WFL Millturn Technologies, explains, “we are aiming at integrating the laser without limiting the flexibility of the basic machine.” The essential point to keep in mind here was the automatic exchanging of the laser unit. The precondition is that the additive production technology can be integrated into the machine without manual intervention. The laser technology supplements the already existing processing options in the machines, leading to shortening and simplification of the process chain and thus also reducing throughput time. Working steps which previously required unclamping and external procedures can now be realised on one machine as part of complete processing. According to Koll, this not only offers advantages in the throughput time and process control, but also helps in improving component quality significantly and saving tooling costs.